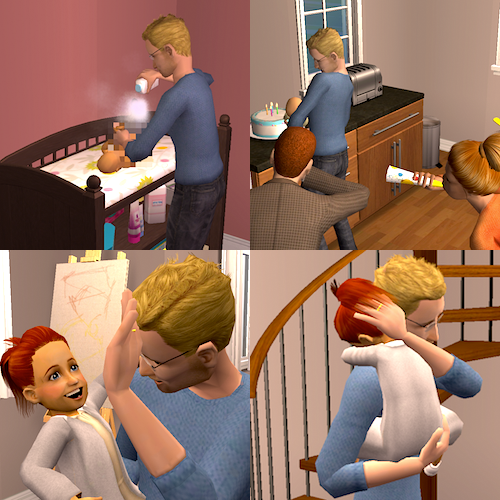 I am really excited to start a little series called "What Happened To...", showing how the maxis-made families in my game have lived their lives! I would love to read how other people have played these characters, so please leave comments letting us know what happened to them in your game! This post is going to be about what has happened to Dustin Broke in my game. I sent him to college to study biology with the aim of reaching the top of the Natural Scientist career. ...and she said YES! They quickly arranged a small ceremony with close family and friends. Angela fell pregnant soon after and gave birth to a beautiful baby girl, Kaley. Angela was able to be a stay at home mum because Dustin earned so much money. She was the happiest she had ever been! But one day, in a freak accident, Angela died a tragic and sudden death. Dustin was devastated. Dustin had to quickly adjust to being a single parent to Kaley. He is a wonderful, caring father and they have a very close relationship. She looks just like Angela. Kaley grew up into a creative and playful young girl. She loved playing with her dollhouse and also having a small lemonade stand set up in their front garden. Her dad was her first customer and often invited friends and his brothers round to buy some lemonade. Dustin is the best dad Kaley could ask for! He is still working to achieve his life goals and plans to treat Kaley and some other family members to a vacation to his beach house. 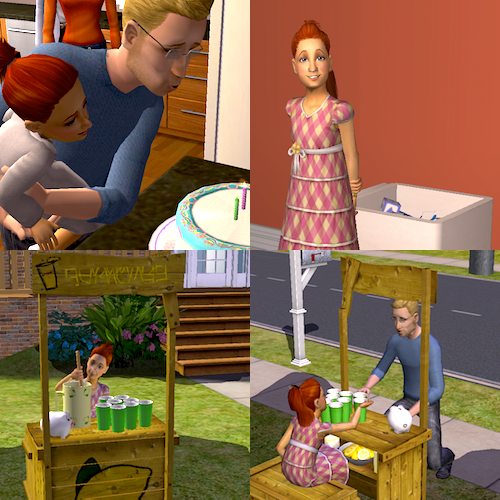 Kaley will grow up fast and perhaps she will also be a fortune sim and follow a similar path to her father? Or maybe a popularity sim like Angela?